I remember clearly when the first UltraViolet (UV) titles launched. I had followed the development of the UV content ecosystem over several years and was excited to finally be able to start building a digital locker where I would be able to access my entire library in the cloud without the hassle of disc based backup to burned discs or hard drives. The format seemed destined to succeed as it gained support from every major studio (except Disney of course) and major retailers like Walmart, Target, Best Buy and others. There was even an announcement Amazon would join, which might have put the format over the top, but that never happened as we know. Walmart, through their Vudu streaming service, was the flagship provider of the UV ecosystem and the primary reason the service had any success at all. They provided the best UV service in my opinion as the Vudu app was fairly ubiquitous and provided an easy way to register, purchase and view videos with high quality playback and a clean interface that had several sorting options and didn’t clutter your library with duplicates. I have heard a few complaints about the Vudu user interface, but I never had a major problem with it and I think most issues have been cleared up by now. Vudu even made UV locker sharing with family or friends an easy process, as going through the UV website to do so was a bit arduous. The family sharing aspect of UV is one of its best features because if a family member on the account buys or registers a movie, it just shows up in your account as if you bought it yourself. Vudu also pioneered the Disc to Digital service which allowed you to redeem a digital copy of discs you already owned for a nominal fee, saving users hundreds of dollars to bring their libraries to the cloud, although the selection was always a bit limited for many users’ tastes. Other major UV streaming services included Flixster (run by Warner Studios), Cinema Now (acquired by Best Buy), Target Ticket and M-Go. Just a few years into the format’s launch UV seemed poised to dominate the digital locker landscape due to virtually no competition and huge amounts of industry support, then Disney decided to finally launch their UV competitor into the market, Disney Movies Anywhere (DMA), powered by their Keychest technology. At first I and many others hoped that Disney would find a way to merge the service into UV so we could have one big happy digital locker family, but it became clear that wasn’t going to happen. One interesting thing about DMA was it quickly gained support with the tech giants that UV was never able to, namely Apple, Amazon, and Google. It was never made clear why these companies were opposed to UV, but I suspect the very generous content sharing features may have had something to do with it. Vudu also joined DMA shortly after it was available, solidifying Vudu as my preferred service since I could now access all my digital content from one provider. Although it didn’t solve the problem of how my UV group members were unable to access Disney content due to the different locker silos. Not long after the launch of DMA there appeared to be some cracks forming in the UV platform which continued over the next few years. First, some services started to fold such as Target Ticket (which interestingly also supported DMA) and then some studios started removing the “UV” marketing term from disc packaging and started referring to it as “Digital HD“ Flixster was ultimately sold to Fandango, who also ended up buying M-Go and essentially merged the two into FandangoNow. CinemaNow was also eventually sold off by Best Buy and no longer provides UV service. UV services were originally available overseas but apparently, support has been dropped almost altogether. 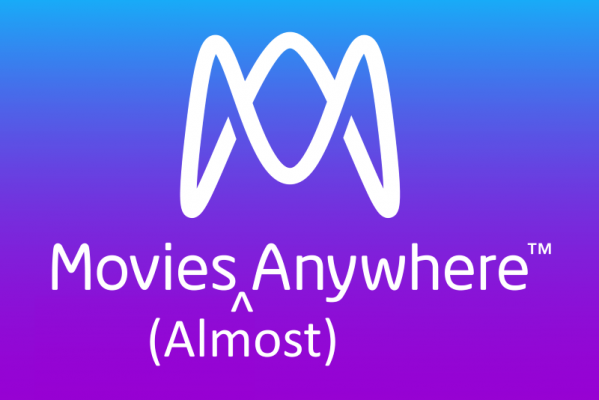 However, the worst blow to the UV ecosystem was when Disney launched the Movies Anywhere (MA) platform in October of 2017 along with support from all the major studios except Paramount and Lionsgate, and all retailers that supported DMA. One would have thought the two ecosystems could have existed side-by–side, but then Fox started dropping UV status from their new titles at the end of 2017 followed by Universal shortly thereafter. This has created a situation where Fox and Universal titles will no longer sync across UV user accounts, like Disney titles. This is only relevant if one already had a shared UV account as setting up new shared accounts stopped being supported recently. Providing another sign that the UV content ecosystem is on its way out. Recently, UV took another major hit when FandangoNow started supporting MA and dropped UV status from all titles that were MA compatible. Now only titles from Paramount, Lionsgate, and a few others even show up in the UV section of FandangoNow. So, it appears UV is on the way out, and MA is the future. What are the pros and cons of MA versus UV? I would say one of the biggest disadvantages of MA versus UV is that sharing of movie libraries is severely restricted with MA in comparison to UV. With UV, every member had their own unique login and could link that login to multiple retailers and could contribute to the library by redeeming or buying content that would sync across all member’s libraries through the central UV site hub. For example, each member could have their own personal Vudu account, CinemaNow account, etc. In contrast, each MA account can only be linked to one iTunes account, one Vudu account, one Amazon account, etc. MA does support multiple users however, but each sub-user must use the master login to access the account, a ridiculous limitation. And, each sub-user cannot contribute with their own iTunes, Amazon, etc., account or register/purchase content via the MA app. One workaround is that iTunes and Google both support family accounts that can share video content; with Google being the more flexible of the two. With iTunes, each family member must be tied to the same credit card, which one may not want to do with an extended family member or close friend. Google does allow individual family members to have their own payment method. However, Google Play Movies isn’t available on the Apple TV or Fire TV boxes, and movies must be individually added to the family library by users only from the app. Which is a bit tedious and the Google Play Movies app on iOS isn’t the most user friendly. Another disadvantage of MA is that it is still missing support from Paramount, Lionsgate and a few other small studios. At least with Vudu, and sort of FandangoNow (they oddly siphon your UV content into a separate section of your library) you can still access all movies, UV & MA, from one service which isn’t possible with other MA providers. Yet another disadvantage of MA is they don’t support playback of 4K or HDR in their apps. Now, they did recently start showing redemptions as UHD which should flow to supported services and be available in UHD, but UV has supported UHD rights redemption for a while now. With Vudu and FandangoNow both supporting UHD/HDR. However, the whole UltraHD Blu-ray digital copy redemption issue has been a mess for a while as it is difficult to determine if you will get a UHD digital copy or not. It is getting better as more titles are redeeming in UHD than before, but it will likely still be awhile before they get the kinks worked out and you can count on getting a UHD digital copy when buying a UltraHD Blu-ray. There is a great Google doc that lays out when and where you can redeem to get UHD digital copies but it shouldn’t have to come to this type of process to get what you paid for. On a related note, iTunes does have a great feature where they automatically upgrade 1080p content to UHD/HDR once it becomes available. As well as only charging HD prices for UHD content. So even if you obtain an HDX movie from Vudu it will sync across MA and you will receive a UHD/HDR version as soon as its available in iTunes. Other services have matched on price for new releases, but not the free UHD upgrades. Hopefully that will change. Now MA does have a few advantages over UV to get excited about. The major one already referred to, is syncing with Amazon, iTunes, and Google Play in addition to Vudu and now FandangoNow. These services are among the most popular streaming services, so your once isolated iTunes/Amazon/Google video libraries will sync with one another. Buy on one, it shows up everywhere. Another advantage is MA is just simpler to set up, use, and sync to other services than UV ever was. MA also allows playback from the site or the apps, something UV never supported. Also, “Movies Anywhere” is just a better name than “Ultraviolet”. Communicating exactly what it does in a succinct way to customers. I think once UHD rights handling is improved, and individual MA users can hopefully have unique logins and can contribute to libraries, as well as all major studios coming on board MA will finally be what everyone hoped for from UV, a simple service for collecting and sharing digital content. Until then is will continue to be Movies (Almost) Anywhere. This is great! I was just researching this and this was a great write up! Keep it up!